WHO: South Bronx ResidentsWHAT: A vote by the Industrial Development Agency on a proposed $80 million NYC subsidy package to on-line grocer FreshDirect to move to the Mott Haven neighborhood in the South Bronx. WHY: Without public hearings or notification last Tuesday, city, state and Bronx officials announced a nearly $130 million subsidy package for Fresh Direct to leave its Queens facility and expand its operations at the Harlem River Yards in The Bronx. The proposed project would bring more heavy diesel truck traffic to our already high asthma-inflicted communities and, despite misrepresentations made to the media, fails to guarantee any new jobs, much less living wage jobs, for South Bronx residents. South Bronx residents demand equitable and environmentally sustainable economic development proposals that are developed democratically and that create jobs at a living wage. BRONX, NY, February 13, 2012: Community residents and activists will rally Tuesday, February 14th at 8:45 AM outside of 110 William Street, to demand that the board of the New York City Industrial Development Agency vote to block FreshDirect’s sweetheart deal in the Bronx. The deal was suddenly announced last Tuesday, February 7th. Governor Cuomo, Mayor Bloomberg, and Bronx Borough President Ruben Diaz, Jr. hailed the privately arranged deal as a win for everyone. FreshDirect is expected to receive a $130 million subsidy package from the city, the state, and the Bronx in exchange for its decision to relocate from Queens to the Harlem River Rail Yards along the waterfront in the Mott Haven neighborhood of the South Bronx. But local community members are upset about the adverse impact that FreshDirect’s relocation will have on the South Bronx. They have organized a group called SOUTH BRONX UNITE! STOP FRESHDIRECT! and find numerous aspects of the deal and how it is being portrayed disturbing, deceptive, and deleterious to the health and welfare of the South Bronx community. “Fresh Direct has pledged to bring new jobs to the Bronx,” said Mychal Johnson of Community Board 1, “But they have no obligation to do so. 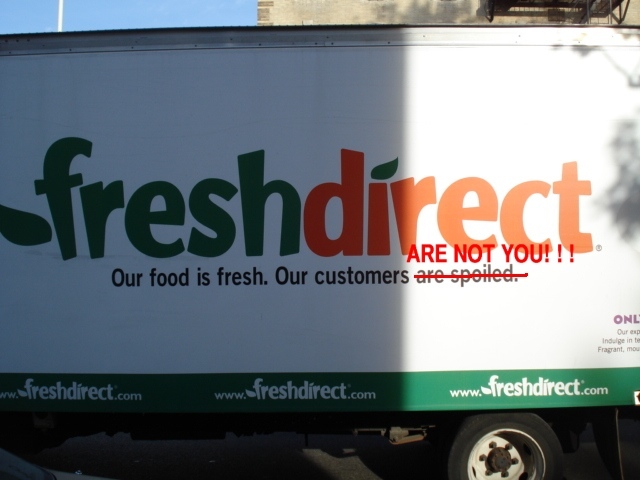 FreshDirect is not penalized if they fail to reach their job creation targets. There are no mandates or incentives to hire people from the South Bronx, which has one of the highest unemployment rates in all of New York City. Further, there is no guarantee that FreshDirect jobs would even be at a living wage.” According to subsidy watchdog group Good Jobs New York, the city is failing to leverage the proposed subsidies for the creation of good jobs for people that need them. In addition, GJNY claims the IDA has failed to provide taxpayers a clear cost/benefit analysis of the benefits expected to be awarded to the company. 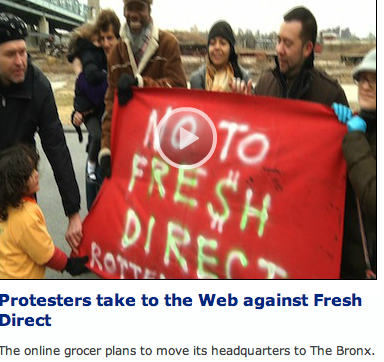 @FreshDirect is exploiting the South Bronx, sign the petition and let your voice be heard! Fresh Direct: Stop Fresh Direct from building its headquarters in the the South Bronx.